Wha? Eleven days? What the hell, April? I’m sorry, everyone. I’ve done all of no writing on here in a week and a half. On the plus side, I wrote something for you at work yesterday. Yes, I got paid to do this, but only because I was on the clock at the bookstore. 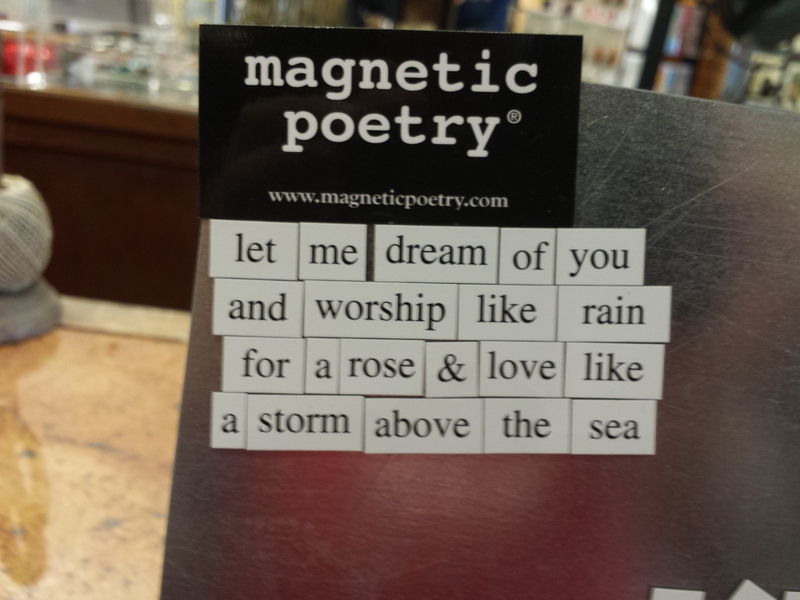 My boss was in the process of rearranging half of the gift merchandise in the store when I got to work last night, and she handed me the Magnetic Poetry (copyright info here) display. We were switching all of the magnets to a slightly smaller display, so I was instructed to fit all of the demo magnets on the smaller stand. I did as instructed, but I also took the time to craft a short poem for my favorite readers (but don’t worry, you can all read it). And here’s the text of said poem, just in case you’re having trouble getting that photo to load. Amazing what can be made within such seemingly narrow parameters.